This week saw PTIC cows sell from $925 to $1770 to average $1381. The top price was paid for this line of 25 PTIC Angus cows sold as part of the Murraba Angus breeding herd dispersal from Willatook, VIC. These Te Mania and Lawsons blood cows were 3-4 years of age and in calf to Angus bulls. DESPERATELY tough seasonal conditions saw numbers continue to slip away on AuctionsPlus this week, with listings declining another 11pc to 5883 head. With little spare feed available to take bought cattle home to, the seasonal impact was also seen in clearance rates, which remained below 50 percent across all sales, and below 35pc in the weaner and yearling sale offering. Prices for completed sales in all heifer categories strengthened, while some steer weight categories also improved. Joined female numbers increased by more than 500 head to total 1495 head, boosted by two large herd dispersals from western Victoria and Esperance WA. This week saw PTIC cows sell from $925 to $1770 to average $1381. The top price was paid for a line of 25 PTIC Angus cows sold as part of the Murraba Angus breeding herd dispersal from Willatook, VIC. These Te Mania and Lawsons blood cows were 3-4 years of age and in calf to Angus bulls. The Murraba herd dispersal included 490 PTIC Angus females. Across the offering, a 70pc clearance was achieved, with the Angus females averaging $1573. PTIC heifers this week sold from $1101 to $1635, averaging $1336. 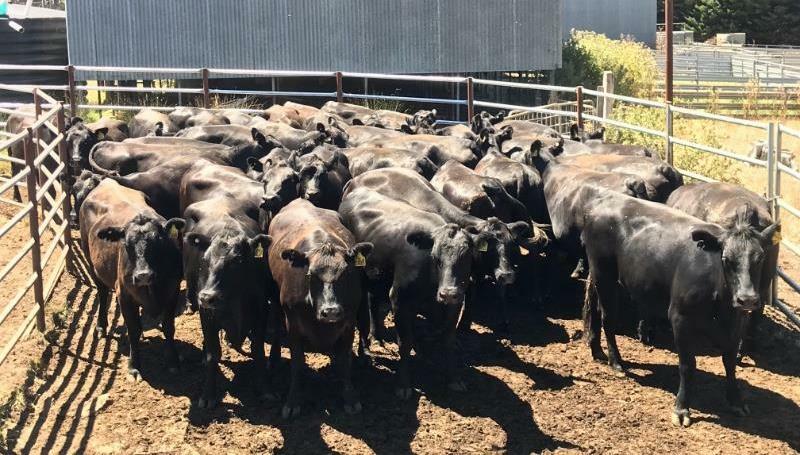 A line of 12 PTIC Booroomooka and Te Mania blood Angus heifers 30-31 months averaging 580kg, and joined to Angus bulls, from Guyra, NSW returned the top price. These heifers will travel to Strathcedar, NSW. Cow and calf numbers halved this week to 296 head listed, selling from $1175 to $1585. The top price was returned by a line of 20 Angus x Hereford cows & calves from Jingellic, NSW. These cows were 4-8 years averaging 597kg, and were joined to Angus bulls. The calves at foot are Angus-sired and 4-5 months old. The line will remain locally, travelling to Albury, NSW. From Dungowan, NSW a line of 17 Angus heifers 30 months of age averaging 362kg, with first calves at foot, sold for $1175. The heifers will travel to Tamworth, NSW. Sired by Wagyu bulls, the calves at foot are 3-4 months old and averaged 93kg. Female listing numbers this week were also boosted by 549 PTIC Angus cows offered in a special sale for the Willawayup Farms, Esperance WA herd dispersal, sold in 17 lots. The offering comprised cows from 2-5 years of age, returning an average price of $1475 and a 100pc clearance. A top price of $1800 went to a line of 30 Angus PTIC cows 24 months averaging 609kg, and joined to Angus bulls. Numbers listed in this week’s Weaner & Yearling Sale dropped by more than 2000 head to total 2694 head. Clearance continued to fall with the trying conditions, sitting just over 35pc, with post-sale negotiations to come. Weaned steers sold from 233c to 324c to average 273c. From Mendooran, NSW a line of 89 Angus steers 6-7 months averaging 217kg sold for the top price. They will travel to Bathurst, NSW. Heifer highlights included a line of 18 Charolais cross weaned heifers from Trangie, NSW returning $815 or 250c. Averaging 325kg, these heifers were 6-8 months old. Highlights from Western Australia included a small line of Angus vealer heifers from Northcliffe returning $1325. These Lawsons blood heifers were 9-11 months of age, averaging 393kg. Another 55 Angus cross mixed age cows, 746kg at 4-12 years, from Mayanup sold for $1425.